​Planning a Proposal? 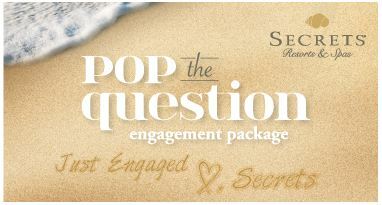 Contact Tina at 512.355.1817Let Secrets Resorts & Spas be the picturesque backdrop for the most important question you will ever ask. Selling Price: $299 USD or complimentary when staying 5 nights in the required room category or higher. Pricing is based on double room occupancy. Engagement package details can be arranged upon arrival. Additional terms and conditions for any package add-ons will apply.